Home » Nature Photography » On Frozen Pond! A bull moose’s normal water hole in frozen in Jasper, Alberta. So what is a moose to do? Simple actually! We watched this bull moose stride to the edge of the pond and poke a hole into the ice. Next, he cracked the hole a bit larger until he could make the hole big enough to stand over. Then the show began! 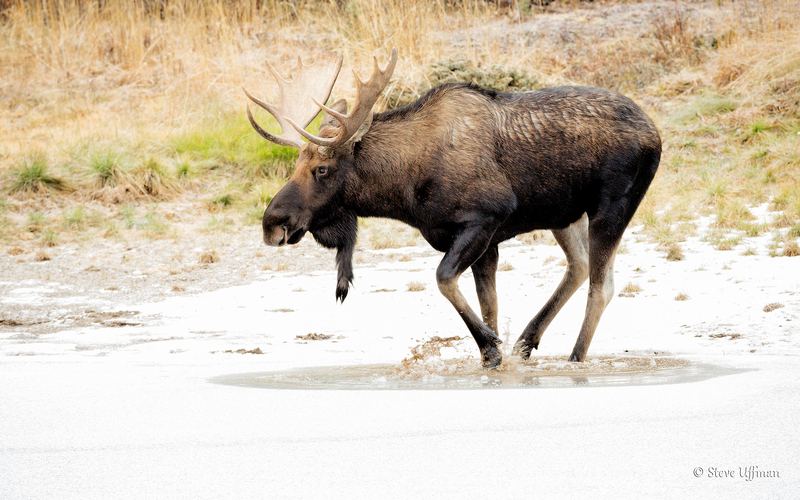 The bull moose then virtually ran in place until it had a hole large enough to drink and remain open for a bit. Fascinating to say the least.